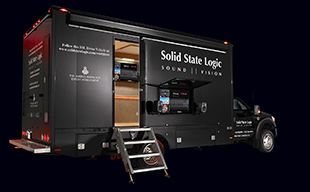 TLALPAN, MEXICO – Solid State Logic is proud to announce that as part of the ongoing development of a global partner network for SSL Live consoles, pro audio specialist Audio Acústica y Electrónica S.A. de C.V. will distribute SSL Live in Mexico. "Audio Acústica is proud to be the face of the SSL Live in Mexico," says F. Javier Posada Morales, Director General of Audio Acústica y Electrónica S.A. de C.V. "As the next big thing in live mixing, SSL Live is definitely setting new trends and standards for live audio, which is something the company has been doing for more than 35 years in the music, broadcast and post production markets. By joining forces with this prestigious brand, we are able to distribute and support the live console of the highest quality to our customers in the region." "Audio Acústica is a great company with depth and personal relationships with the highest level audio companies in Mexico," says George Horton, Vice President, Western Region, Solid State Logic, Inc. "Live audio has some deep roots in Mexico, so we wanted to have the best possible partner to help bring the SSL Live to the region and also to support our clients for years to come. We are honored to work with Audio Acústica to raise awareness of the console."